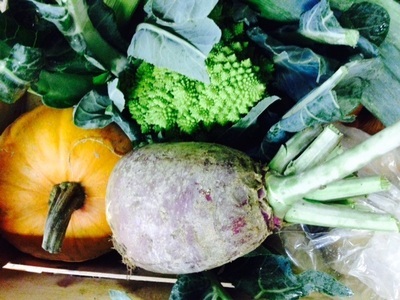 Our Halloween veggie boxes contain the traditional pumpkin for carving (and eating! ), as well as swede, as carved by the pagans, but more work than a pumpkin ! There is also a treat, a 'Romanesque' (Italian Broccoli) - beautifully alien and totally delicious.The carvings in the middle are done by a box scheme customer after our annual farm walk.